On one of my many trips of late to J-mart (think Home Depot in Japan and you'll have an idea) and local nurseries for the garden, I spotted these little guys for sale as I took my usual stroll through the plant section. (I can never resist at least a walk-through the flowers and vegetables, and invariably I come away with more than a few unplanned seedling and seed purchases.) Next to the broccoli, peas, and cabbages was a good-sized section of dandelions. That's right - dandelions. The bane of most American gardeners and lawn fanatics they are sold here in Japan as an edible green. I almost bought some just because the sight of them made me smile and laugh out loud. They are certainly an edible wild plant, but most folks just want to dig them up to and eradicate them. A recent Wild Ones Forum ruminated on our childhood habit of blowing the seeds everywhere, and now having to dig them from restored meadows and other plantings. Despite the frustration of the member who started the discussion, this also made me smile. I used to love doing that! Isn't it interesting how vegetation in various areas of the world is seen differently. What is considered important in one country is just tossed aside in another. You said it, Anjuli. It's amazing to me, too, that here what we would "weed" out at home from cracks in the driveway or sidewalk, etc., are often left. My impression of Japan is that it is almost painfully tidy and orderly (which it can be), but then there is another side that likes a touch of chaos or surprise. Wabasabi, I suppose. 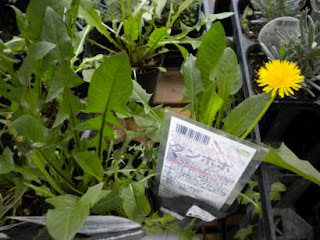 I smiled about buying dandelions, too. A friend who butterfly gardens was desperately buying "organic milkweed" plants this winter. I was laughing that I had lots in the pasture she could have. So why are you in Japan? Hi Stephanie, I wish you had been our neighbor in Michigan! I planted a fair number of milkweed in our yard in an effort to turn it into meadow. After we did a burn in the yard, I scattered seeds and did a little finger-crossing. I'm not sure how things are going now, but I've got high hopes! My husband is teaching English at a university here, which was a bit of a spur of the moment decision. We're so glad to be here, though. It's a great place. I think I could probably sustain my entire family for at least a week with all the dandelions in our yard. I spent an entire day pulling up the ones in the front yard (much to my neighbors' amusement)and the next morning it looked like I hadn't even been in the yard. Sigh. I've embraced them again and let them do their thing! Plus my daughter likes to rub them on her face saying she likes "butter." I know exactly how you feel, Rachel. When we lived in Michigan I did some battle, but then decided to give up. My grandfather makes dandelion wine, and I think I should have given his recipe a go if I was going to go to all that work. A friend said something quite nice, though, when we were discussing our lawns. She said all those non-grassy folks - violets, dandelions, fleabane daisy, etc. - meant that the previous owners hadn't used chemicals on our lawn. That was heartening, and so I left them be, and started randomly planting early bulbs to add to the festival feeling.